This insightful work chronicles the life of George Washington Carver, the renowned African American scientist and teacher. George Washington Carver: A Biography begins with a discussion of the political and social circumstances in Missouri where Carver was born into slavery, circa 1864. Readers will follow Carver through his formal education to his decision to accept Booker T. Washington's offer to teach and do research at the Tuskegee Institute in Alabama. 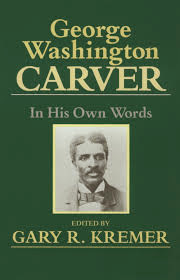 The bulk of the volume focuses on Carver's career at Tuskegee, a career that spanned nearly five decades, from 1896 until Carver's death in January 1943.The book highlights Carver's major achievements, including his championing of crop rotation and the hundreds of products he created from peanuts, sweet potatoes, and other plants native to the South. In addition to Carver the scientist, students will meet Carver the man, who, for example, loved art and painted throughout his life.